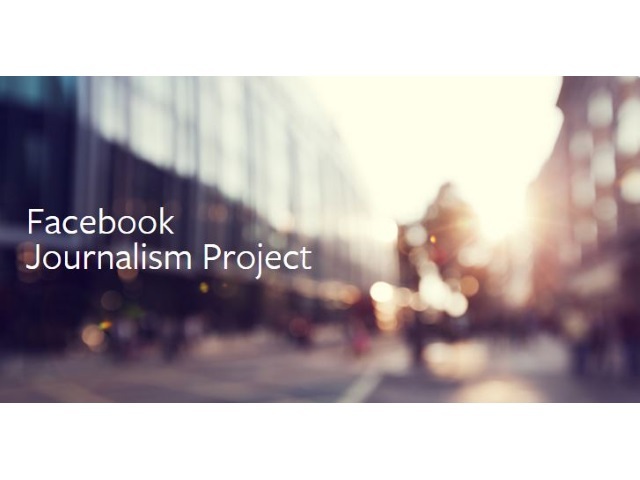 Facebook’s efforts to bolster its relationships with media and news organizations and journalists continued with Wednesday’s introduction of the Facebook Journalism Project. Director of product Fidji Simo introduced Facebook Journalism Project in a Newsroom post, saying that the initiative has three objectives: collaborative development of news products for the social network, training and tools for journalists and training and tools for users. Facebook is a new kind of platform, and we want to do our part to enable people to have meaningful conversations, to be informed and to be connected to each other. We know that our community values sharing and discussing ideas and news, and as a part of our service, we care a great deal about making sure that a healthy news ecosystem and journalism can thrive. That’s why today we’re announcing a new program to establish stronger ties between Facebook and the news industry. We will be collaborating with news organizations to develop products, learning from journalists about ways we can be a better partner and working with publishers and educators on how we can equip people with the knowledge they need to be informed readers in the digital age. While we’ve worked with our news partners on this in the past, as part of the Facebook Journalism Project we’ll begin an even deeper collaboration with news organizations across the spectrum, connecting our product and engineering teams so that we can build together from the early stages of the product development process. We want to work with partners to evolve our current formats—Facebook Live, 360 video, Instant Articles, etc.—to better suit their needs and work with them on building entirely new ones. For example, we’ve heard from editors that they want to be able to present packages of stories to their most engaged readers on Facebook. We’re starting to work with several partners on how best to do this. We’re going to start testing this using Instant Articles, so that readers can start to see multiple stories at a time from their favorite news organizations. This is a very early test, and we will continue to work with partners on how to make this product great for them. We’re interested in exploring what we can build together with our partners to support local news and promote independent media. This initiative is in its earliest stages; we want to talk about it now so that we can get as much input from newsrooms and journalists as possible, working together to shape what local news on Facebook could look like. Many of our partners have placed a renewed emphasis on growing their subscription funnel, and we’ve already begun exploring ways we can support these efforts. This month, our engineering team, in collaboration with the engineering team of German news organization Bild, will launch a test to explore offering free trials to engaged readers, right from within Instant Articles. This is the kind of work we want to do more of. We’ll also keep working on monetization options for partners, such as expanding our live ad break test to a wider group of partners and exploring ad breaks in regular videos. We’ll be launching a program globally where Facebook engineers will host sessions with developers from news organizations to collaborate to identify opportunities and hack solutions. We meet regularly with our media and publishing partners, and as part of the Facebook Journalism Project, we’ll make an even more concerted effort to do so, with new rounds of meetings with publishers in the U.S. and Europe as a start in the months ahead. We’ll expand that listening tour around the world over the course of the year. We’ll host many of our global partners at F8, Facebook’s annual conference in the Bay area, and we’ll keep sponsoring important journalism and publishing conferences, including the Digital Content Next conference in January and the Perugia Festival of Journalism this spring. Starting Jan. 12, we will begin to test a way for publishers to combine multiple Instant Articles into one post. Publishers simply choose the articles and a cover image or video to package together in a set of Instant Articles. People on the latest version of our iOS and Android applications will be eligible to see these posts in News Feed and on publishers’ pages in the coming weeks. We’re in the very early stages of developing this feature and understanding which use cases it could enable for our publishing partners. Initially, we are testing this feature with Bild, BuzzFeed, El Pais, Fox News, Hindustan Times, India Times, Refinery29, The Sun, USA Today and The Washington Post to get their input. As we better understand the value this experience provides people and publishers, we look forward to working with more of our partners to help shape the future direction of this experience. On the topic of training and tools for journalists, Simo wrote that a series of e-learning courses on Facebook products, tools and services is currently available, and it will be expanded to nine additional languages. Facebook will also team up with organizations including the John S. and James L. Knight Foundation, the Detroit Journalism Cooperative, the Institute for NonProfit News, Local Independent News Online and the Institute for Journalism in New Media to provide training in local newsrooms. Facebook acquired content performance platform CrowdTangle last November, and Simo revealed that it will be available to the social network’s publishing partners free of charge. Today, we’re launching the ability for page administrators to designate specific journalists as contributors, giving them the ability to go Live on behalf of the page–a change designed to make such reporting more flexible for newsrooms. In the future, we also want to bring to profiles all the flexibility that the Facebook Live API (application-programming interface) provides to pages, so journalists can use their professional equipment to go live. And we’re now going to offer journalists a simple way to see how their public videos are performing on their Facebook profiles. You can read about these and other updates on our Media blog here. And she issued a reminder that Facebook joined the First Draft Partner Network last September, teaming up with other platforms and more than 80 publishers to find, verify and publish content sourced from the social web. We are rolling out the ability to go Live on Facebook via a web browser to pages. A variety of broadcast types, like daily vlogs, benefit from an easy, stable camera setup, and bringing Live to laptops and desktops will make this style of broadcasting easier. Starting later today, we’re rolling out a “Live Contributor” role in pages, allowing admins to designate specific individuals to go live on behalf of a page. This gives contributors the flexibility to stream great live content from a mobile device on behalf of a page whenever it happens, while allowing the page admin to maintain security and control over their page. In the coming weeks, video metrics for public videos will be available for profiles with 5,000 or more followers. These lightweight insights will provide a way for public figures such as celebrities, journalists and politicians to better understand how their video content performs on Facebook. Available for both individual live and regular public videos, these metrics will include total minutes viewed, total number of views and total engagement (reactions, comments and shares). People will also be able to see aggregated insights for all the videos they post on their profile over seven-, 30- and 60-day periods, including the total number of video posts, engagement, total views and minutes viewed, and total number of profile followers. Video insights for profiles will also be available in the Mentions app over the coming weeks.